Good Morning Onward Nation…I’m Stephen Woessner and welcome to this week’s solocast…Episode 440. If you have been listening to Onward Nation for a while — you know that I like sharing strategies along with all of their tactical step-by-step processes that help business owners create predictable, measurable, and repeatable success for themselves and their teams. Today’s solocast will be no different. We are going to dig into how hosting a podcast can be a perfect strategy for owners of business-to-business professional services firms. 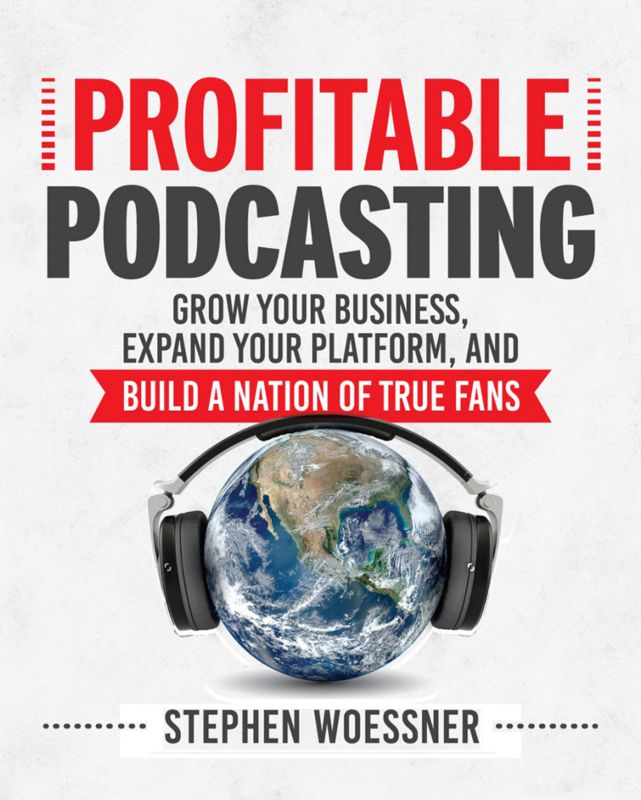 I am going to take you deep into a sneak peek of the pages of my latest book, entitled Profitable Podcasting. The book will not be released by my publisher until September but I want to begin sharing some of the insights now so you can begin to apply. This book is comprehensive — and it is a research-based book that shares our full blueprint or “recipe” for podcast success with you. Each and every step is presented in complete transparency. Not a single step has been hidden from you. It’s all here, in plain sight. Within the book, I will walk you behind the green curtains of Onward Nation and Predictive ROI so you can learn our proven system. You will also have access to in-depth insights from 10 business owners just like you. Each of them decided to create a podcast to change the game – and then did it. Their impressive stories are shared in full transparency too. But why write such a comprehensive book? Because you deserve a resource that eliminates the guesswork, demystifies the process and gives you a clear and concise strategy for going from zero to launch in about 30 days. Only limited resources were available when my Predictive ROI team and I decided to create Onward Nation. Sure, there were plenty of hyperbole packed eBooks and webinars that led me into the sales funnels of information marketers, but those resources lacked depth, and candidly, they lacked business acumen. We quickly consumed the resources and were left with more questions than answers. Plus, the resources lacked full transparency. They typically provided just enough to get you interested in learning more, and then pitched a $997 online training or mastermind program. All of which drove me crazy and didn’t solve our problem. Not awesome! But there are much more important reasons I decided to go as deep as possible with the book. In my opinion, podcasting – as a medium – deserves a long-form guide, an encyclopedia of how to do it right. 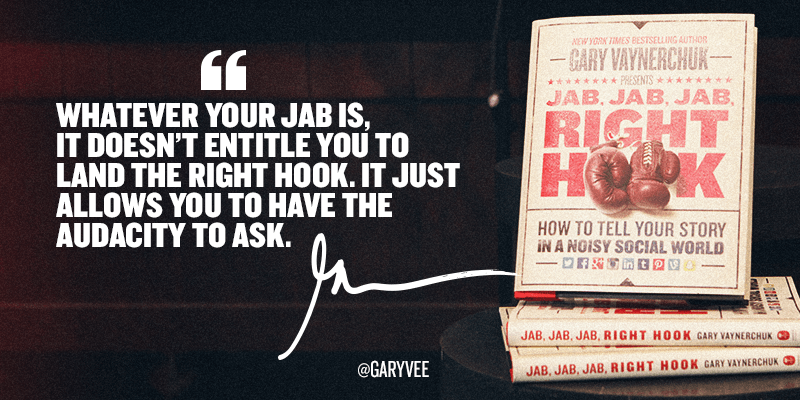 When I interviewed Gary Vaynerchuk before the release of his social media book Jab, Jab, Jab, Right Hook (by the way — still the best book on the market regarding social media and the business strategy behind it all), we discussed how it wasn’t just a social media book, but a business book that would elevate social media to a new level of legitimacy. My hope is that this book will raise the bar for podcasting just as Gary did for social media marketing. So on the surface, Profitable Podcasting looks like a podcasting book. But it’s actually a business book about how business owners just like you are using podcasting to grow their companies, expand their platforms, and build nations of true fans. I promise you — each chapter includes step-by-step instructions so you can create, launch, market, and monetize your own podcast. The book includes checklists, production schedules, weekly goal tracking, social media strategies with visual examples, promotional emails, guest invitations, exclusive access to private online video tutorials, and other resources including time-saving third-party tools. I am excited to share this resource because small business has been my focus for 23 years. This is my third book devoted to helping small business owners succeed. Helping small business owners is deeply rewarding for several reasons. First, having owned five small businesses, I know that in today’s economy, if one wants to have an impact (as I strive to do), then small business represents a tremendous opportunity. Small business owners are the lifeblood of our economy. Second, the 28 million small businesses operating in the United States today, according to the Small Business Administration, account for 55 percent of all jobs and 54 percent of total revenue generated. I want to help as many business owners as possible grow so they can create more jobs and improve the lives of their families, employees, and communities. Third, this book tackles the top challenge facing most business owners: According to a recent survey of 1,100 small business owners, 43 percent of respondents identified growing revenue as a top challenge facing U.S. businesses in 2016. That’s more than 12 million businesses expected to face the same challenge. Driving this number down is a worthy goal of this book. And if you know my family history — and our story — you will understand why I am so passionate about the success of small business owners. But…there are significant challenges to small business owners who want to have a podcast. It is not as simple as just turning on the microphone, recording a conversation, and distributing it out to iTunes. Sure you can do that…but it is highly unlikely that your time and effort will pay off for your business. So for today’s solocast…I am going to address the challenges that typically paralyze business owners from either getting started — or — keep them from achieving the success they aspire to achieve from their podcast. So here we go, Onward Nation. Ready for the deep dive? Rock solid awesome! First…a podcast is just a tool. It’s just a platform, Onward Nation. A platform is simply a conduit for distributing or sharing content. No platform in and of itself will help your business grow revenue. This is a very important point. Just because you have a podcast — does not mean — that prospective customers or even an audience will begin to flock to you. In order for your podcast to be of value to your business, there needs to be purpose behind the guests you invite to be on your show. There needs to be purpose behind the questions you ask your guests. There needs to be purpose behind how you nurture and take care of your guests before their interviews and after their episodes have aired. And ultimately, you need a strategy for how your podcast will grow your business, expand your platform, and build your nation of true fans. Having interviewed nearly 500 of today’s top business owners – and having talked with, consulted with, or worked with many of them in producing and launching their own podcasts – I can say with certainty that there are typically three primary challenges or questions that well up in the mind of a business owner who is considering a podcast. Some business owners need to confront all three; others may just need to confront two. But I assure you, Onward Nation — every business owner will need to confront at least one. Question #1: How will my podcast make money and help grow my business? Question #2: How much time with this take me? I will devote a future solocast to the revenue topic. But for this week — we will dive deep into Questions 2 and 3 because they are critically important to getting your mindset right before heading down the podcasting path. If you don’t get your mindset right, I assure you, there will be setbacks and challenges along the way. Without the correct preparation you will be tempted to quit – and you likely will…quit. Most podcasters quit after just 7 episodes. It is called “Podfading” — because a business owner launches his or her weekly show — then expects the show to set the world on fire just because it is available — and when it doesn’t — they quit after not even two months. However, if I help you properly set expectations, when the challenges come your way, instead of being tempted to quit, you can confidently say to yourself, “Ah, Stephen said this would happen and that I’d feel this way” – and you will push forward. Don’t ever quit, Onward Nation. Let me help you AVOID THE TIME TRAP. One of the questions I am asked most often by business owners who have considered a podcast for their business is, “How much time will having a podcast take out of my schedule?” It’s a great question because we should all protect our schedules. Most business owners assume the answer is 10 hours a week – and that the solution will require them to add staff and make other investments. But here’s the reality: You can have an awesome, top-rated podcast in iTunes by investing less than four hours per month. Would you grow revenues faster if you invested more time? Likely yes, but four hours a month is an excellent place to start. So why would business owners assume that my answer would be something like 10 hours a week? Because then it would be easy for them to justify why they hadn’t pursued it more seriously. But in fact, it isn’t the perceived time commitment that stops a small business owner from having a podcast. Fear often rears its ugly head in an attempt to derail the entrepreneurial journey you’re on. Fear will beat you to your knees if you let it. Fear will cheat you out of success in all aspects of your business, including developing a great platform like a podcast so you can grow revenue and build a nation of true fans. Once business owners are assured that their time investment will only be about four hours per month, a second challenge typically comes to mind – this one with the subconscious goal of thwarting the podcast from gaining any additional momentum; to snuff out the fire that was building. But what will be YOUR BIGGEST MOST PAINFUL CHALLENGE on your path to use podcasting to grow your business? These two fear-laden questions should serve as warning signs that something sinister is lurking. If you let them, they will keep you in check and prevent you from moving forward. The truth is, we all face such challenges. It’s just that some people are better than others at pushing themselves past them. In my opinion, this challenge may be blocking your success not just with podcasting, but in other areas of your business as well. Actual, objective evidence of their competence doesn’t matter to those who exhibit the syndrome. They remain convinced that they’re frauds. They feel that they don’t deserve the success they have achieved. Calling it “luck” or “good timing,” they never take credit for their accomplishments. Perhaps they believe that they’ve tricked others into thinking they are more intelligent and competent than they actually are. Have you ever walked into a meeting and felt that you weren’t worthy — or that you didn’t belong there? Perhaps someone on the selection committee, the award committee, or board of directors had made a mistake in selecting you. I began to learn about the imposter syndrome back in 2009, around the time my first book was published. I was an academic staff member at the University of Wisconsin-La Crosse. After my book became popular with small business owners, several of the UW campuses around the state asked me to teach a class at their respective campuses. Awesome. One day I mentioned this opportunity to a family friend: I told him I headed to the University of Wisconsin-Green Bay the next day to teach a class based on my SEO book. My friend was not trying to be hurtful — not in the least. But those comments hit me hard. Never mind that my SEO book was #3 in the United States, or that I had just been interviewed for Inc. Magazine, or any of the other credibility indicators. The imposter syndrome will work hard to hold you back. High-performers with imposter syndrome may work obsessively hard to prevent people from discovering that they’re “impostors.” And talk about a vicious cycle: The hard work leads to more praise and success, which only perpetuates the impostor feelings, leading the “imposter” to work even harder, which can lead to sleep deprivation, burnout and worse. Ingredient #2: the “Imposter” takes the proof of success and passes it off as luck, timing, or as a result of deceiving others into thinking they are more intelligent and competent than they believe. Has your business ever gone through a growth spurt that you couldn’t explain? Have you ever looked around your office and suddenly realized you have some amazing people working for you and looking to you for leadership – and yet, you cannot figure out what they see in you? Have you ever felt uncomfortable before a presentation with a new client? Did you wonder why they invited you to the table? Here’s the important point that I really want you to get. When you ask yourself, “How on earth were we able to hire such amazing employees? Don’t they know that we don’t know what in the world we’re doing?” — your brain does a funny thing…it gives you an answer. It’s a crummy answer but it’s an answer. You were invited into the evaluation process because you have a stellar network — perhaps stellar credentials — and you deserve to be at the table. The voice on your shoulder — the voice whispering in your ear — is the imposter syndrome. And we all deal with it. It doesn’t matter who you are thinking of right now. Tim Ferriss, bestselling author of The 4-Hour Workweek, has dealt with it. Joel Osteen has dealt with it. All of the incredible business leaders that grace the cover of Entrepreneur magazine deal with it. Every business owner — every political leader — every leader throughout history has dealt with this. George Washington did not feel he was worthy to be this country’s first president. 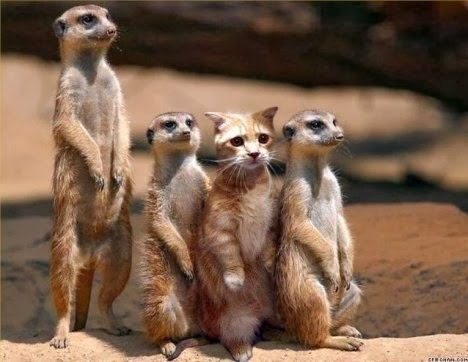 No one is immune from imposter syndrome. But what is unique — and what is special — is when someone faces the fear of potential rejection. Because it is oftentimes fear — which is another way of describing imposter syndrome — gets in your way more than anything else. You may be your own biggest constraint. Not your ability to schedule guests on your show, not your ability to sell, not the market, not your lack of customers, not your pricing, not your product quality. 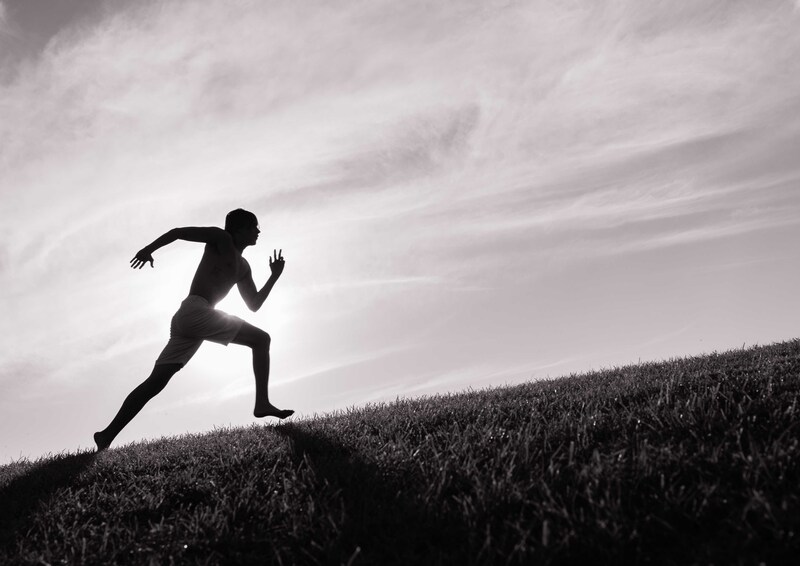 You, as the owner, set the pace and tempo of your company — either fast or slow. So let’s look at all three of these. First, get clear on what the next level is for you and your business. Well, if imposter syndrome (aka FEAR) is making you believe you are not even worthy of your current level of success, then how could you possibly believe you’re worthy of being the host of a top-ranked podcast? Instead, perhaps you need to spend some time being thankful for what you have already accomplished — consciously acknowledging that what you have achieved has been well deserved because you worked hard and you applied your God-given gifts and talents to get there. Now, to realize your full potential, it’s time to leap off your current plateau and move onward to that next level. You deserve to be at the next level. The first step is to give yourself permission to define that next level so you know when you, your podcast and your business have arrived. Second…be scared about the next level…and do it anyway. Kick fear to the curb. What’s the worst that could happen? Prospective customers could say no. You might make a bad decision and lose some money. An employee or a group of employees may disagree in how you’re redirecting the company and could decide to leave. Okay. Are any of these life-threatening situations? Did anyone die? No? Then move on! Finally, find a mentor to learn from as Don Yaeger recommended in the Foreword of this book. More specifically, find a mentor or group of mentors who are all moving at a pace and tempo that is faster than you. It matters who you spend your time with — and if you spend your time with people who are moving at your current pace — or slower — those people may make you feel comfortable to be around — they may not challenge you — they may not push you or ask you tough questions — and it is easy to relax and unwind. Why? Because as Coach John Wooden once said, “You will never outperform your circle.” That’s just human nature. So you need to make sure the mentors you select are operating at a completely different level than you — a level to which you can reach and stretch. You want to get into a group of people where you don’t currently belong and then work like crazy not to get left behind. In the process you’ll expand and grow. You will then be able to leap from your current plateau onto the next rung. As Onward Nation guest Scott McKain taught me, “Stephen, you cannot reach that next rung, unless you are willing to let go of the current one you are hanging on to.” Wise words. You were meant for greatness, Onward Nation. You are instilled with an infinite abundance of talent and gifts. Don’t let something so small as fear limit all you were meant to be. Don’t give up — keep pushing — and don’t ever, ever quit. If you are going to be successful at using podcasting to drive your business onward to that next level — you need to get your mindset right first. Because when you do — you will no longer be at risk of podfading — and then the next step — will be for you to bolt on a monetization strategy to your podcast so you have an opportunity to drive significant revenue into your business. I will cover monetization in a future solocast. We will be back tomorrow with an exceptional interview with Nick Creswell from Thomson Reuters in London — who will take us inside why he believes that today’s leaders lead with culture. Nick is off-the-charts amazing. You will not want to miss it.